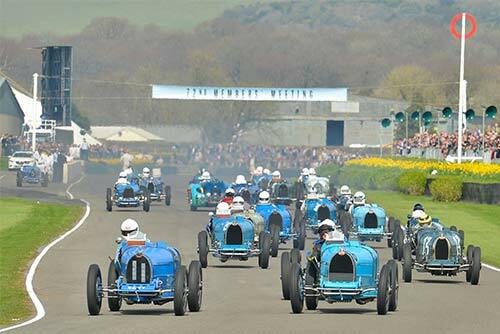 Highlights from the Goodwood 72nd Members’ Meeting, (probably) the most significant new historic motor racing event of the past 15 years – will be broadcast on Channel 4 on successive weekends in April (2014). The two 25-minute shows, will be broadcast in Sunday morning slots during April and will be presented by Amanda Stretton with commentary from Martin Haven. Episode one will be screened on Sunday, April 13 at 0640 and will feature action from a thrilling part one of the Gerry Marshall Trophy for Group 1 touring cars – including a stirring fightback from Emanuele Pirro’s Capri – plus the Surtees and Moss Trophies and glorious Group B rally and turbocharged Formula 1 cars plus an interview with Sir Stirling Moss and Lord March. Episode two will be broadcast on Easter Sunday, April 20 at 0545 and will include action from the world’s largest Bugatti-only race, the Grover-Williams Trophy – plus the enthralling story of racer-turned saboteur William Grover-Williams. Celebrities Chris Evans and James Martin reveal why they adore Goodwood while the low-drag Le Mans demonstration and part two of the Marshal Trophy round out an action-packed show. Did you miss the Goodwood 72nd members meeting? There is still time to book tickets for this years Festival of Speed and Goodwood revival or why not attend one of their very popular (and free) Breakfast club events?